Three documents of the Jewish community in Peki'in and a booklet on the settlement's history. Peki'in and Tel Aviv, 1910-1932. 1. Handwritten letter from the Jews of the village of Peki'in to the directors of the Anglo-Palestine Bank, 18 Heshvan 5671 (November 20, 1910). In the letter, the Jewish settlers of Peki'in request aid in acquiring land around the village and tell of the grim situation of the Jewish settlement in Peki'in, saying that many settlers have left the country: "We, the Jews of the village of Peki'in, the last survivors of the rural settlements in which our brethren formerly resided from time immemorial, turn to you today… to be our mouthpiece and represent our impoverished, failing community. You should know, our brothers and honorable ministers, representatives of the national bank, that just thirty years ago most of the lands of this village belonged to Jews, and it is only due to the heavy taxes imposed then by the government on our land and produce that nearly all our lands here passed into the hands of strangers… and therefore, since then and until today, our settlement has grown ever smaller and many of us have strayed abroad, for they have no land to sow at all… we thus turn to you now with a request, honored directors, that you attempt to purchase for us land here around the village, in a manner which will be proper to both sides, us and the bank…". The letter is hand-signed by representatives of the Jewish families in Peki'in, including the Zinati family, the Oudi family, the Mizrachi family, the Toma family and others. The letter is also signed with the "Stamp of the Holy Community of Farmers in the Village of Peki'in near the Holy City of Safed", with a drawing of the carob tree at the entrance to the cave of Rabbi Simeon bar Yochai. 2. Proclamation of the "'Yeshurun Community' Committee in Peki'in Village, Palestine", from August 5, 1925, requesting donations through the emissary Zion Halevy, due to the difficult condition of the Jewish community: "It has no shochet, no doctor and no room for a school… and the ancient synagogue in the village is about to collapse". Formulated as a personal letter, with a blank space where the addressee's name is to be filled in. Signed on the bottom in print by the leaders of the community, and with an ink stamp identical to the one in item no. 1. 3. 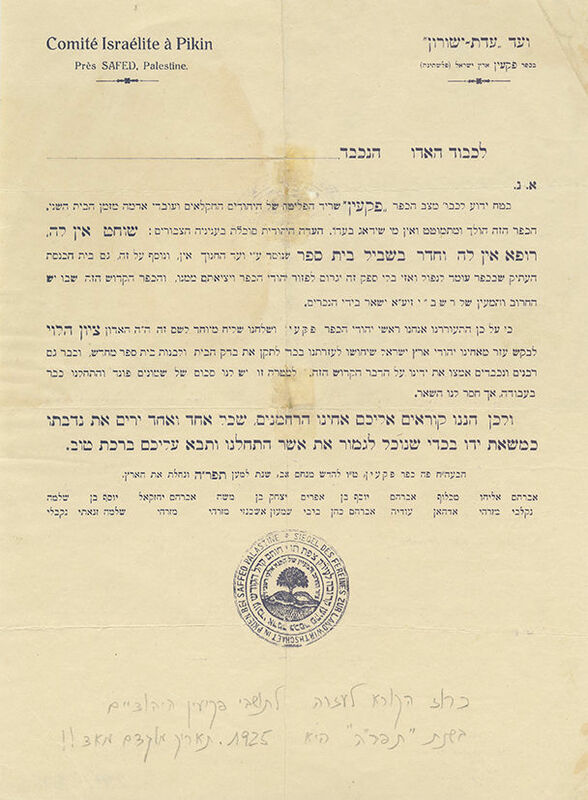 Handwritten permit from February 22, 1932, granted to the Jewish teacher Ben-Zion HaCohen to represent the Jewish village before the national institutions in Jerusalem and to be absent from his teaching duties. Signed by fourteen of the village's Jewish residents, with an ink stamp of the "Committee of the Peki'in Jewish Community" different from the stamps on the two previous documents: the carob tree has been replaced by a date palm (apparently according to the legend that the carob becomes a date palm every Sabbath eve). 4. The Jewish Settlement in Peki'in, by Yitzhak Ben Zvi. Ahdut Ha'Avoda Press, Tel Aviv, 1922. Booklet surveying the history of the Jewish settlement in Peki'in, with pictures of sites and figures. Size and condition vary. Good-fair overall condition. Folding marks, stains, creases and small tears to margins. Filing holes to letter. Restored tears to proclamation and permit (with slight damage to text). Tears and blemishes to booklet's spine, with a strip of adhesive tape to its entire length. The back cover of the booklet may be missing.